1. NBR Status - Cliquesteria has now Doubtful status on NBR, I suggest to you to email their admin and press-release to inform them that it is not fair. What has actually happened is 1 Member made multi accounts on NBR, he made a few accounts there and he posted negative comments with each account. I have informed the owner of the forum that it is extremely not fair and that their vote system is totally corrupted, but they do not listen. It is why, I would like to ask you to email the NBR owner and let him know that Cliquesteria has always been paying to its members. NBR Email: [email protected] - copy this email and use it to send the NBR owner your statement. The people who do this, will receive 50 cents in their main balances. The action is limited time, please be quick, I will keep it open for a few days only. Use the above link to post your payment proof and do not forget to vote with 5 stars for Cliquesteria. This will show them that our sites has always been paying, and we work serious, not like many other sites. Help the site, and the site will always keep paying to the members who work honestly here. If we are not supported by you, we will not be able to keep working like we always are since 2015. 3. New Offerwall is coming soon with more PTC ads to click. 4. I want to remind you that the Neteller minimum payment is 5$. 5. New Update on the Rented Referrals system - we have a new modification on the rented referral system which will serve better filtered referrals to you all, no matter the upgrade. I hope this will reflect on their activity and they will be better than before. VERY IMPORTANT: I have missed to let you know that I see many new members who are not watching the Bonus ads, nor the Offerwalls. If you all do not want to monetize your actions here, I will close all the ptc ads and will only keep the Bonus ads. You must understand that the ptc ads are bringing profits only to you, and they bring loss to me. I wish to see you all working with the Bonus ads and I wish to see you all completing more Offerwalls. I can assure you that we have Videos to watch, PTC ads, Super Easy surveys, Crowdflower Offers and many other super easy and simple tasks among the offerwalls. It will take you 5 minutes the first time to find all these easy markers. You can easily earn a few dollars a day if you know where to look for these videos, easy surveys and ads. Help me and you will not regret it! If someone needs directions or help, I am ready to show you where are all these easy things to earn from. Open ticket and ask me and I will show you. Thanks Admin. for your nice update and add new Offerwalls for Ad clicks to complete the daily task set by you. Don't worry, I am trying my best to complete your daily task, but due to lack of such offerwalls like Offer4all, I could not complete the task for all your 4 sites, but only one or two. Now with your additional good offerwalls for add clicks will be useful to complete my tasks. Another thing, you would have noticed that I pay full attention to your bonus ads, though it is a hard work, due to Captcha and so many pop-ups, and time consuming efforts to complete a single ad. 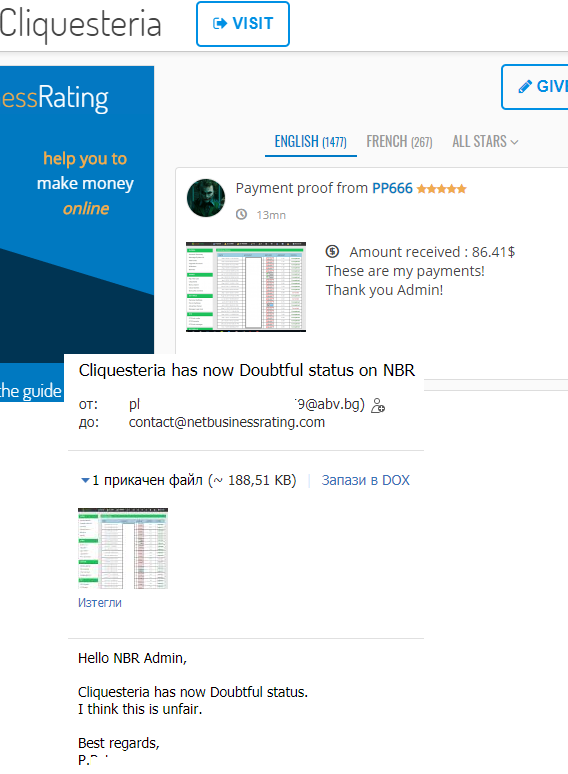 I have already posted my last payment proof on netbusinessrating.com. I have sent an email to them as well. Let us know how we share those details with you. As for bonus ads, I do watch with many problems. Some of these urls don't work. Like when I click on get link it split into two with both link taking me to different sites. In this scenario neither you get paid nor I. Another one is dutchycorp.space. I keep on clicking and it keeps on opening new tabs. Many times I have to restart again after clicking get link button. It will be easy for all of us if the process is completed in one go. If we keep on clicking and neither of us is paid than why we need it? why in "cliquebook" lost tech support? Open a support ticket and we shall discuss the details..... Thank you for your help!